In central Italy the city of Urbino became the capital of a rich and very important dukedum during the 15th century. In particular the Court of Federico da Montefeltro (1422-1482) provided the small dukedom in the "Marche" (an italian area) with an European atmosphere. The great freedom of thought, the eclecticism of the knowledge mastered by the prominent people who daily visited the palace-town wanted by the Duke, made Urbino able to compete with Venice and with the main European Courts for the role of "ideal town". Federico da Montefeltro was a great captain and became famous as a great leader of mercenary troops. The survival of the Dukedom required important military actions and the need to be updated about the new military technology. It was not by chance that at the Court of Urbino there were not only poets, scholars and painters but also important mathematicians (Piero della Francesca,1410-1514; Luca Pacioli, 1445-1514) or architects and military engineers (Francesco di Giorgio Martini, 1439-1508; Roberto Valturio, 1405-1475- who mainly worked in Rimini- , Girolamo Genga, 1476-1551, and his son Bartolomeo Genga, 1518-1558). They were usually helped by local labour force and this had positive effects on the economy of Urbino through the redistribution of the wealth of the warrior-duke. Things remained substantially unchanged with Federico's son, Guidubaldo da Montefeltro (1472-1508). His importance is connected with the foundation of the "Collegio dei Dottori", the act is of April 26, 1506 (this date is presently considered to be the date of foundation of the University of Urbino). It was made up of thirteen prominent citizens who had to administer justice. The Collegio was approved by Pope Julius II in 1507, then, in 1564, it was given the right to award academic degrees after an examination; the juridical lectures started in 1576 in the Town Hall and the "Publico Studio" (public lectures) was officially founded in 1601. In the meantime the Dukedom was ruled by Francesco Maria I della Rovere (1490-1538), nephew of Guidubaldo I, who had died without direct successors, and by Guidubaldo II della Rovere (1514-1574). 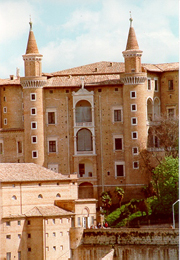 Although the dukes did not permanently stay in Urbino and actually moved often to Casteldurante (actually the city of Urbania) -particularly in the following decades- and sometimes to Pesaro, the beauty and importance of the dukedom did not change, even though there were some signs of decline. 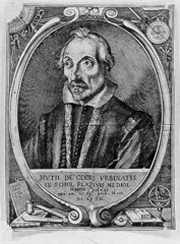 Nevertheless exactly during that century the most prominent mathematicians worked in Urbino: Federico Commandino (1509-1575), Guidubaldo dal Monte (1545-1607), Bernardino Baldi (1553-1617), and Muzio Oddi (1569-1639) who was also an important architect. 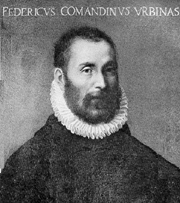 Moreover Costanzo Felici (1525-1585), a physician with noteworthy naturalistic interests, played a very important role, too. The tradition of military engineering went on with Jacopo Fusti Castriota (1512-1562) and Simone Genga (16th century), even though the great war experiences already belonged to the past (this therefore explains the atmosphere of decline mentioned before). In this period a trade of scientific-instrument making (the "Officina degli Strumenti scientifici") was set up; its origins are unknown but it fully worked in the first half of the 16th century. The Officina degli Strumenti was particularly prestigious and it was linked to the most eminent mathematicians of the time, among them there were Muzio Oddi and Guidubaldo dal Monte (though indirectly). An important aspect was that Galileo Galilei had contacts with the mathematicians in Urbino and that he later (June 9, 1618) went to visit the Duke of Montefeltro; his geometric-military compass has many similarities with other analogous instruments designed by the scholars of Urbino. In a synthetic way we can conclude that between the 15th and the 16th century several and separate scientific schools were set up in the background of the magnificence of the Court, though they were something clearly different from any academic institution: the sciences were always strictly connected to the flourishing business and trade activities. The only merely academic institutions that were already present at that time- together with the Collegio dei Dottori- were the various convents, and particularly St. Francis', in which the studies pursued the tradition of the late Middle Ages.